A judge has declared a mistrial in the case of a man who claims he killed a Virginia store manager because he thought the victim was a werewolf. 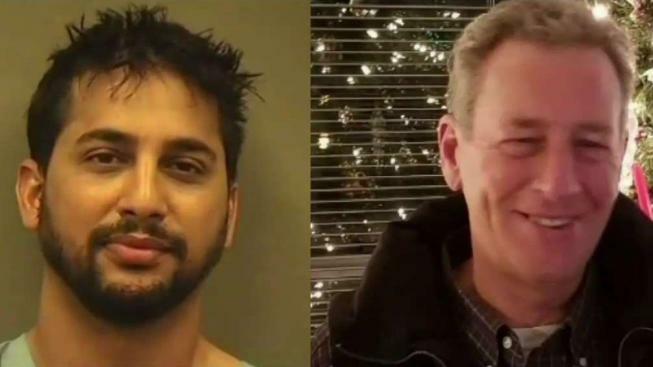 Jurors had deliberated for three days in the trial of 34-year-old Pankaj Bhasin, who is charged with murder in the July 13 death of Bradford Jackson. They told the judge Wednesday morning that they were hung and couldn't reach a unanimous decision. The judge told them to take a break and to continue to deliberate. But after about three hours of further deliberation, the jurors said they were deadlocked. The prosecution and defense agreed on some key issues during the trial. Attorneys for both sides said Bhasin viciously slashed and beat Jackson. Both also said he is mentally ill. But they differed on Bhasin's state of mind on the day of the brutal killing. The final two witnesses in the trial said Bhasin was legally insane at the time. A forensic psychologist and forensic psychiatrist testified for the defense that Bhasin suffers from bipolar disorder. They said they believe he was in the midst of a psychotic episode and suffering from delusions when he killed Jackson. Bhasin had checked out of a psychiatric hospital just days before he left his New Jersey home and drove to the D.C. area, according to his attorneys. Attorneys said his first stop was at the Four Seasons in Georgetown. The hotel staff called security when he told them, "People are going to die." He also said, "It's going to be a bad day." Two hours later, he drove to Old Town and walked up a flight of stairs to Jackson's office at Window Universe. Bhasin said Jackson asked him "What are you doing here? Get the f*** out," according to the forensic psychologist who testified. Bhasin then allegedly picked up a box cutter and stabbed Jackson 53 times. He also beat him and broke his neck, police said. “For Brad Jackson, it wasn't just a bad day. It was his last day ... because of what the defendant did to him," a prosecutor said during closing arguments. Prosecutors said Bhasin's threat at the Four Seasons is proof of premeditation and urged jurors to find him guilty of first-degree murder. But the defense claims Bhasin had no idea what he was doing and called for him to be found not guilty by reason of insanity. Jackson's close friends found the defense's argument difficult to believe. "All we do is just hope that Brad didn't die in vain and this won't be, you know, a man who gets out in a couple years and has a life to live and spend time," Andrea Milliken said. "I don’t buy it. I mean, he parked around the back. He walked to the front and he's trying to say he's killing a werewolf?" Jackson's friend Erin Kennedy told News4 outside the courthouse Tuesday. They described Jackson as kind and mild-mannered. "Wrong place, wrong time. Brad was a great guy. He would have never instigated anything with anyone. I would never ever see that coming from him. And to have this guy beat the life out of him, stab him post mortem is disgusting," Kennedy said.